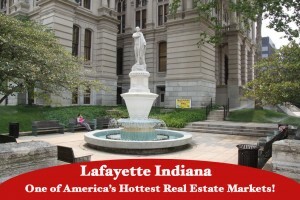 Lafayette, Indiana – one of America’s Hottest Real Estate Markets! Recently, per Realtor.com, Lafayette, Indiana was named as one of the nation’s HOTTEST real estate markets for March 2016. Our market was #20 out of #20 nationwide as a market where buyers are eager and homes are selling fast—listings get two to five times more views than the national average, and homes sell one or two months faster than in the rest of the country. The median list price continued its upward climb. Meanwhile, the inventory of homes for sale is increasing more steadily—but still not as fast as the high demand from buyers. Obviously, the heightened interest for a limited supply of housing is pushing up home prices. A few weeks ago, Jonathan Smoke, the Chief Economist at realtor.com, exclaimed: “All indicators point to this spring being the busiest since 2006.” Now, Freddie Mac has doubled down on that claim and is saying that 2016 will be the best year that the real estate industry has seen in a decade. In 2015, home prices nationally rose 4%, following a 6.4% hike in 2014, and, home values rose in 236 of the 276 cities, according to Clear Capital, a provider of real estate data and analysis. In most parts of the U.S., prices are still regaining ground lost in the bust; they remain nearly 19% below their peak, on average. 2016 looks to be shaping up as one of the best years for residential real estate in Lafayette, Indiana. “We are entering the busiest season of home buying with the lowest amount of inventory in three years. To be competitive, buyers should get pre-approved for a mortgage and be ready to act quickly if they find a home that meets their needs,” says Jonathan Smoke, chief economist of realtor.com. “We are seeing homes hit the market, receive multiple offers and go pending within just a few days and even hours. Meeting with a Realtor for a buyer consultation prior to beginning your home search is your first step to helping your Realtor understand what you are needing and wanting in a new home. If you are considering selling your home, having a knowledgeable Realtor that provides a thorough market analysis to best determine your home’s current value is extremely crucial. You don’t want to give away some of the equity in your home nor do you want to out price your home for the market. Your Realtor should also provide you with a detailed marketing plan to get your home the most exposure as quickly as possible,”says Erin Romanski with The Romanski Group.